Ninety percent of the world's coastal freshwater turtle species are expected to be affected by sea level rise by 2100, according to a study from the University of California, Davis. "About 30 percent of coastal freshwater species have been found or reported in a slightly saltwater environment," said lead author Mickey Agha, a UC Davis graduate student in associate professor Brian Todd's lab in the Department of Wildlife, Fish and Conservation Biology. "But they tend to live within a low-level range of salinity. If sea level rise increases salinity, we don't yet know if they'll be able to adapt or shift their range." Of the world's 356 turtle species, only about seven are sea turtles, 60 are terrestrial tortoises, and the rest live in freshwater environments, such as lakes, ponds and streams. Of those, about 70 percent live near coastlines, which are expected to experience rising sea levels. Some freshwater turtles lose body mass and can die when exposed to high levels of salty water, while others can tolerate a broader range of salinity. UC Davis wildlife biologists have been studying western pond turtles in the semi-salty waters of Suisun Marsh in Northern California. While abundant in the marsh, this species is in decline in many other parts of the state. The researchers observed that the turtles could face a triple threat of drought, water diversions and increased sea level rise, all of which can result in saltier habitats for them. It prompted the researchers to wonder not only how the western pond turtle would cope with such changes, but also how freshwater turtles around the world are expected to fare under the projected sea level rise of three feet by 2100. In their assessment, the study's authors used a warming scenario projected for 2100 to overlay estimates of sea level rise on georeferenced maps of coastal turtle species worldwide. The results indicated that turtles most at risk from sea level rise live in Oceania — Southeast Asia, Australia, and New Guinea — and southeastern North America. In those regions, about 15 species may lose more than 10 percent of their present range. 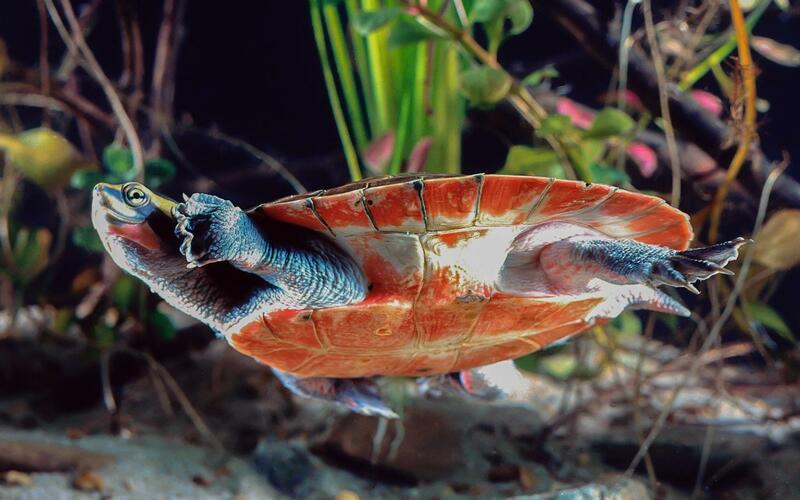 Turtles are arguably one of the more beloved reptiles on the planet. "They're harmless, they're friendly, they live a long time," said senior author Todd. "They're about as inoffensive as you can get for an animal, and they've existed for so long." "If we've underestimated the impact of sea level rise along coastlines, we don't yet know whether these turtles can adapt or shift fast enough to move with the changing salinity, or whether that part of its range will be gone forever," Agha said. Todd added: "This is a species that is slow to evolve. If we rely on natural selection to sustain them, they will likely disappear." The research was supported in part by the California Department of Water Resources, the UC Davis office of Graduate Studies, and the Tennessee Aquarium Conservation Institute.